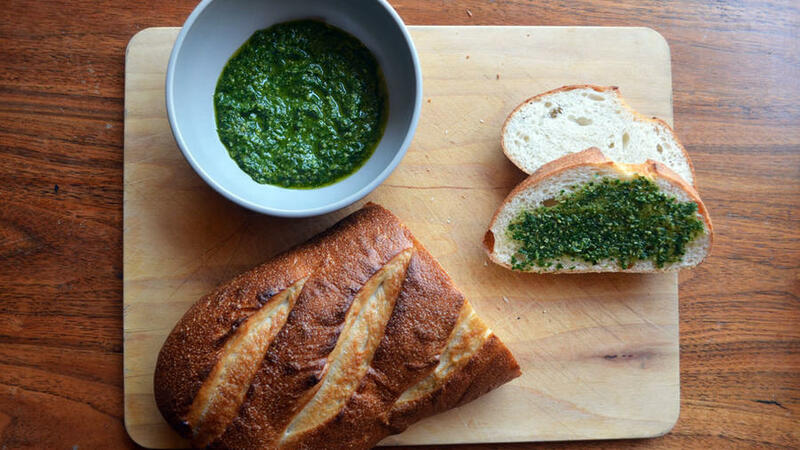 Assistant Travel Editor Megan McCrea got experimental while making scratch-made pesto—with tasty results. As a Sunset editor, I’m somewhat abashed to admit that my home “garden” consists of two half-dead plants that sit atop my refrigerator, basking in the occasional slant of natural light that enters the corner of my San Francisco apartment. So at first, I feared I wouldn’t be able to cook a garden-to-table recipe for this round of Cookbook Club. Happily, our generous Associate Garden Editor, Lauren Dunec Hoang, took pity on those of us who don’t garden at home, granting us permission to harvest fruits, vegetables, and herbs from Sunset’s Test Garden to use in our recipes. Game on! You might remember the Great Cheese Toast Debacle of November, when my over-salted appetizers literally sent my roommates running for water. So this month, I decided to tackle an approachable recipe: homemade pesto sauce. I also love pesto, and I wanted to see if I could taste the difference between garden-fresh and store-bought. And I was intrigued by Hardison’s suggestion to use other herbs in addition to basil, so that’s what I did. What was it like to grow the herbs for your recipe? Since neither of my ailing plants figures in the pesto recipe, I harvested my basil from the Test Garden. I harvested the other herbs—my cilantro, mint, and parsley—from, gulp, Whole Foods. I approached our Food Editor, Margo, for help. We decided that, since the recipe wasn’t totally clear, I’d go whole hog and try all the herbs together. I also stumbled over the toasted pine nuts. The recipe didn’t tell me how, exactly, to toast pine nuts. I figured that I should do so by putting them on a cookie sheet and heating them in the oven. Someone else claimed that I needed to toast the pine nuts on the stove instead. (Confusion! Doubt!) But I did a little research, and it turns out I was right. Yeah! But beyond my difficulties with selecting the right herbs, toasting the pine nuts, and operating the heavy kitchen machinery, making pesto was easy! Delicious! I served my creation on crunchy French bread, and everyone loved it. “It’s good, very herby,” said my co-worker Andrea, Senior Travel Editor. You know, I might actually try growing basil in my fridgetop garden! It can’t do any worse than my other plants. And yes, I would absolutely make this dish again—it’s a crowd-pleaser, and I’ll bet that it would taste just as good on pasta or chicken as it did on baguette. Next time, I’d love to try making it with just basil (or cilantro or mint or parsley) to see how it tastes when I let one herb really shine. “Pesto sauce is my favorite way to use up my stores of basil, cilantro, mint, or parsley, and it’s incredibly versatile. Traditionally, it’s made with a mortar and pestle, but it comes together quickly and easily in a food processor,” says Hardison. Combine the herbs, half the oil, the pine nuts, garlic, and salt in a food processor. Pulse for a few seconds. Scrape down the sides and repeat, gradually adding the rest of the oil until you’ve reached your desired consistency. Fresh pesto keeps for a week in the refrigerator or months in the freezer. If freezing, pour a layer of oil over the top once it’s in the container to protect the delicate leaves from frostbite. Be sure to leave some headspace in your jar for the pesto to expand as it freezes. NOTE: Basil is typically used for pesto, but I like cilantro, mint, and parsley, too. If using basil, I often mix in 1/2 cup (60g) grated Parmesan cheese right before serving.